I'm so excited about this upcoming show! 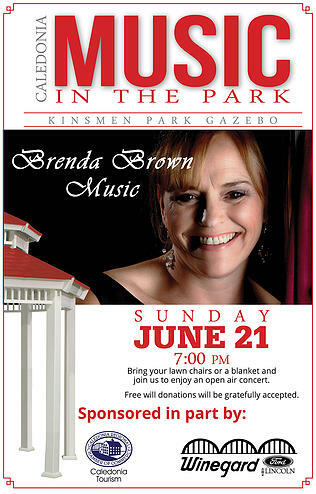 Tourism Caledonia is puting on another series of FREE summer concerts in the beautiful Caledonia Kinsmen Park. The Tom Spratt Gazebo hosts a variety of musical acts once per month throughout the Summer. 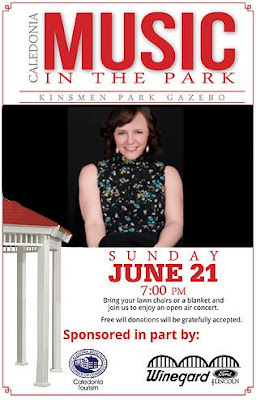 Music in the Park is provided as a free event to the community by the Caledonia Regional Chamber of Commerce, Tourism Caledonia Committee, and a handful of local businesses who sponsor each Sunday concert. Shopping locally is a great way to give back, but free-will donations for future events will also be accepted during each concert. The bandshell is down by the river. Before you go over the bridge (heading south), turn right (west) on Caithness St. (Hwy 54). Park and bandshell is on the left.